Hoops Report: Going out with a roar? 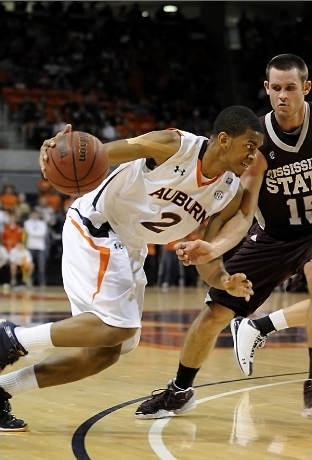 It was January 8th, 2011, and the Auburn basketball team had no identity. The team had only a name, and it was one they didn’t even make for themselves. Rather than supporting the basketball team that night, the band, cheerleaders, mascot, and even radio announcers were all on the other side of the country, in a desert in Arizona. Back home was a hoops squad in a quiet, quiet arena that likely felt more just a basketball team at a football school than any basketball team at a football school ever has. It was the conference opener against LSU. Auburn lost it 55-62, just as they were doomed to do from the very beginning, infamously scoring just 6 points in the first half. It was a night marred by scoring futility, self-doubt, and a feeling of gaping emptiness. Fast forward to last Saturday night. The team was down in Baton Rouge for the regular season finale against that same LSU team. Auburn came back to win in come-from-behind fashion once again, overcoming a 15-point second half deficit in another of its patented, thrilling comeback victories, 60-51. Kenny Gabriel led the way with a game that helped earn him Co-SEC Player of the Week honors. He had 11 rebounds and 16 points, two of which came from one of his signature baseline alley-oop jams from Josh Wallace. EJ Ross scored in double digits for the fifth straight game, scoring 16 points and pulling down 10 rebounds to give himself a double-double of his own. The Tigers played exciting, scrappy, never-quit basketball, just as they have over the past several weeks. And just as fans have come to expect from them, they played the game with a stiff and determined defense and with a creative and audacious offense, and with relentless urgency from beginning to end. They never stop playing, no matter how far they are behind, and they always fight for every loose ball. In short, in the time between the conference opener and the conference closer, the Tigers finally found an identity. And now, they’re in Atlanta, preparing for one last show in the SEC Tournament. With no postseason berth in sight, the SEC Tournament has become the Super Bowl for the Tigers, as it will be their last showing of the season. Auburn’s win against LSU pulled them out of last place in the SEC West standings, and clinched the West’s fifth seed in the tournament. Thanks to a little luck, the rest of the tournament bracket fell into place around them as Kentucky’s victory over Tennessee on Sunday set the East’s fourth seed and Auburn’s first round opponent as Georgia, who the Tigers took to overtime earlier this season, and not Vanderbilt, who they fell to at home by double digits. Auburn (11-19, 4-12) will face Georgia (20-10, 9-7) in the first round of the SEC Tournament in the Georgia Dome at noon tomorrow, televised locally on the SEC Network. Awaiting the winner on a bye will be the West’s top seeded team: Alabama. But before Auburn can think about a potential winner-take-all rematch showdown with the Crimson Tide, they’ll first have to figure out a way to upset the Bulldogs in the opening round tomorrow. Auburn took Georgia to the brink earlier this season, but ended up on the short end with a 72-81 overtime loss in Athens. If the Tigers have a shot at giving Georgia some trouble again, they’re going to need another huge game out of EJ Ross, who hung 30 on the Bulldogs in the previous outing. To put them over the edge they’ll need a big day and some clutch shooting from go-to man Kenny Gabriel, who scored just along with his season average at 11 points last time, and Allen Payne will need to take advantage of his chances as a similar scorer to Ross. On defense, Auburn will have to contain Georgia’s outside shooting, which they have struggled with doing all year. It won’t be easy for Auburn to grab a victory tomorrow. Georgia has been playing well all season — well enough to be widely thought of as a bubble team in consideration for a NCAA tournament berth — and they only lost two games to unranked teams since January (Alabama and Xavier). And they’ll be on what is considered home floor tomorrow inside the Georgia Dome. Auburn’s season has been tough sledding from before it even started; this conference tournament isn’t going to be any different. However, as the Tigers sit tonight in a hotel in downtown Atlanta, they are more poised to pull off the upset than ever. Their mission there is shock the world and knock off their two biggest rivals, and burst their NCAA bubbles, while letting out all of the frustration and all of the anger that this cursed season has brought upon them, all in a furious run to the SEC semifinals and beyond. To put it simply, their mission is to end their conference season the exact opposite way that they started it: Making some noise and going out with a bang. You couldn’t have said it better, Justin – “They never stop playing, no matter how far they are behind, and they fight for every loose ball.” Glad the Tigers have found themselves here at the end of the season and hope they can get some wins in Atlanta. WAR EAGLE! Nothing would be better than to ruin Georgia’s tourney hopes by beating them tomorrow.